President Obama recently set a goal to double renewable power generation in the U.S. by 2020. At the same time, he suggested ending oil company tax breaks and using them, instead, to bolster solar and wind industries. The U.S. government is investing more than $1 trillion in green energy, the so-called "clean" energy alternative, while choking off coal and natural gas production with increasingly onerous regulations. 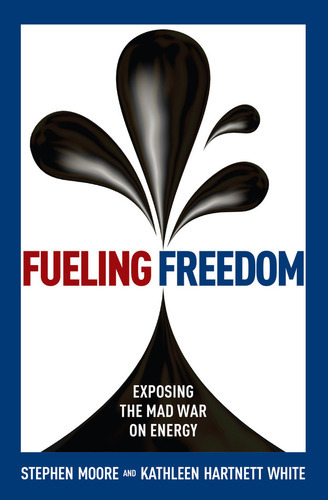 In their book, Fueling Freedom: Exposing the Mad War on Energy, authors Stephen Moore and Kathleen Hartnett White argue against the shift to renewables. Using energy-production statistics and the historic contributions of fossil fuels, they explode the myths promulgated by renewables cheerleaders. They expose the extensive misinformation on clean energy resources to effectively argue against what they believe would be a disastrous, energy production shift that would have serious lifestyle and geopolitical consequences for Americans. Promoters of renewable energy sources -- the supposed “low environmental impact” alternative to fossil fuels -- are putting forth a false narrative, Moore and White assert. Rather than worrying that carbon energy resources are destroying the planet and looking to renewable energy as an alternative, the authors suggest we should celebrate the vast contributions fossil fuels made during the past century, advancing mankind and making our lives safer, more productive and economically and politically secure. The U.S. has more recoverable energy supplies than any nation on earth, the authors posit. With fairly recent shale oil and natural gas discoveries and newer technologies of horizontal drilling and hydraulic fracking, we are in no danger of running out any time soon. It should be welcome news, they urge, that the U.S. can be energy independent within the next few years and be the world's dominant energy producer. Freedom from OPEC manipulations and the potential for millions of jobs that would substantially add to our gross domestic product, benefits our national security and would be a welcome boon to our relatively stagnant economy. Moore and White explain how the Industrial Revolution, fueled by carbon energy usage, broke through decades of static human existence and brought significant and historic, upward trends for the average person, including a tripling of life expectancy and a 10- to 30-fold increase in per-capita, real income. Coal and petroleum transformed into energy for mechanical power was the most important energy conversion in industrial civilization. With coal-powered machines, man was suddenly liberated from the physical limitations of muscle and beasts of burden. When electricity became available, heat, power and countless household appliances, industrial motors and electronics were developed, generating a second, energy revolution. Carbon-resource usage (and the invention of the internal combustion engine) brought liberty, mobility and choice, enabling sustained productivity and economic growth, the authors maintain. Additionally, it revolutionized the science and practice of metallurgy and dramatically transformed textile production. Previously expensive and tedious to produce, clothing became more affordable and warmer; winter clothing became available. Today, 60% of global fibers come from fossil fuels. In addition, fossil fuels played and continue to play an important role in reducing food supply loss by refrigeration, packaging and containers. The authors marvel at the transformation that took place in a newly industrialized society. Until coal was harnessed on a massive scale, humans were dependent on energy from plants, wood, animals and human muscle, as well as wind and water flows. The dramatic shift from diffuse and variable flows of energy -- wind and water -- to massive stores of hydrocarbon minerals was a turning point for human progress. Energy became transportable, controllable, affordable, dense, reliable and versatile. Fossil fuels have also dramatically benefited agriculture. The authors detail that U.S. food production has tripled, using 1/3 of the land, 1/3 the labor, and at 1/3 the cost of pre-fossil-fuel agriculture. In the past, over 50% of the U.S. population was involved in agriculture and food was scarce and expensive. Today, only 3% of the country’s population produces our plentiful food supply. The economic implications for today’s shale revolution are equally extensive, especially if drilling is allowed on federal lands. The authors estimate tax revenues in the trillions of dollars. They cite the economic prosperity of North Dakota, with potentially greater oil resources than Saudi Arabia and currently more millionaires per capita than any other state. The Great Plains state has already surpassed California and Alaska in oil production and is second behind Texas. The U.S. currently has 50% more oil reserves than in 1950. Technology and innovation have increased our supply so that we discover new sources faster than we deplete known reserves. Further, economic efficiencies in extraction, processing and conversion of energy result in less spending for greater energy output and a continuing reduction in the energy infrastructure physical footprint. By comparison, non-fossil-fuel energy sources -- wood, wind, solar, hydro, geothermal, biomass and nuclear –make up only 15% of the world's total primary energy supply and provide significantly lower energy yield and potential. For example, the power density -- power per unit of volume -- of natural-gas-fired, electric generation is almost 2,000 times greater than that of wind-generated electricity. Using ethanol produced from corn to power a vehicle's internal combustion system creates a net energy loss when the energy used in planting, fertilizing, harvesting, distilling and transporting is factored in. Further, the diversion of 40% of the U.S. corn crop to ethanol, a less efficient fuel than gasoline, has raised corn prices and prompted more farmers to grow corn instead of other vital crops. Biomass energy production, with its accompanying upticks in tractor and farm vehicle usage and chemicals, reduces the food supply, increases fertilizer and water use, and adds to pollution. Production of wind, solar and biofuels uses thousands more acres of land than coal, natural gas and nuclear power. According to Jess Ausubel,1 an average wind system uses 460 metric tons of steel and 870 cubic meters of concrete per megawatt. In contrast, a natural gas combined cycle plant uses about three metric tons of steel and twenty-seven cubic meters of concrete. As for carbon dioxide falsely classified as pollutant, Moore and White remind readers of basic eighth grade science: Carbon dioxide is essential to plant life, on which all human and animal lives depend for food. Plants inhale carbon dioxide and exhale oxygen used in human respiration. Commercial greenhouses actually use elevated levels of CO2 to stimulate plant growth and that plant life flourished during past periods of higher CO2 levels. The authors criticize the misguided trend to replace our fossil-fuel-based, electric system with wind, solar or biomass. They argue that green energy can't compete in a free market without bringing scarcity, economic decline, physical suffering and geopolitical crises. The reliability of renewable energy suffers from weather vagaries whereas coal, natural gas and nuclear power deliver energy precisely as needed. Moore and White bemoan the political clout of the Environmental Protection Agency and its myriad regulations and question its integrity and usefulness. They assert that emissions actually began to fall in the 1960s, nearly a decade before the establishment of the EPA. During the same time as the EPA’s anti-industrial "back to nature" philosophy took root, air quality actually improved despite a doubling of fossil fuel use with an accompanying 200% increase in the GDP. These improvements came from emission reductions and controls made by private business rather than EPA mandates, the authors maintain. Between 1980 and 2010, airborne sulfur dioxide declined by 89%, carbon monoxide by 82%, nitrogen dioxide by 52%, ozone by 27%, particulate matter by 27% and mercury by 65%. Over the past few decades, tailpipe emissions declined by more than 90% with miles traveled increasing by 180%. In recent years, a massive, wind and solar renewables program failed miserably in Europe. It caused precipitously higher prices and scarcities, prompting hundreds of thousands of families to turn to wood burning in desperation (thus inflating furniture and paper prices) and spurring construction of new coal plants. The threat of blackouts, unacceptably high utility bills and corporate flight resulting from this renewables program, threatened the very stability of Europe. Citing Europe’s dismal example, Moore and White explain that contrary to the popular exaltation of renewables, a prosperous American future will be driven by abundant, reliable and inexpensive fossil fuels.